If you’re in your late 30s or early 40s, hearing that “40 is the new 30” will put a smile on your face. But hearing medical experts warn that “45 is the new 50”? That’s a colloquialism that is a whole lot less welcome. 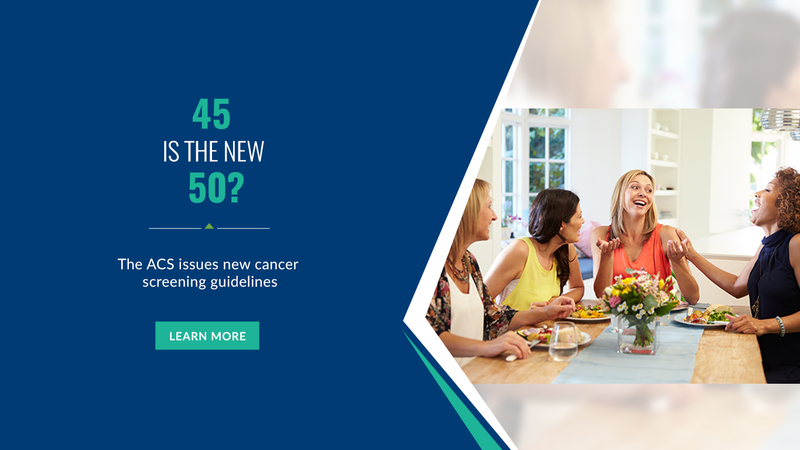 Sadly, when it comes to colorectal cancer risk, 45 is the new 50. That’s because colorectal cancer diagnoses in people under 55 have doubled among the 20 to 49 age group, causing the American Cancer Society to recommend first-time colon cancer screenings at 45 years of age—not left until age 50*. Because many physicians aren’t expecting to find colorectal cancer in younger people, they are misdiagnosing or reluctant to order tests—and this leads to more late-stage diagnoses in younger patients. In fact, recent study reviews have found that people younger than 55 are 58 percent more likely to be diagnosed with late-stage colorectal cancer. Last year, the New York Times reported on the case of Kirsten Freibourg, a 22-year-old only eventually diagnosed with colon cancer because her mother insisted on more tests when her daughter’s symptoms continued. Kirsten’s cancer was discovered via a flexible sigmoidoscopy. “I would never have guessed that a 22-year-old would have had cancer,” admitted the doctor who carried out the procedure. To prevent colon cancer, you need to understand the causes and keep up with screenings. The change to the human microbiome as a result of the modern diet. The microbiome consists of trillions of bacteria in the human gut. A well-balanced microbiome is vital for gut health and a strong immune system. An imbalance of “good” and “bad” bacteria is linked to cases of colorectal cancer. A healthy lifestyle is essential to combatting colorectal cancer. Go for scheduled screenings and see your doctor right away if you have any GI symptoms that concern you. A review published in World Journal of Gastrointestinal Oncology looked at how complex and long the diagnostic procedure process for colorectal cancer (CRC) can be, with delays caused by multiple referrals and waiting times for tests. If you don’t feel your doctor is taking you seriously and/or your symptoms don’t improve, insist on the tests you need to get a proper diagnosis. Often, a colonoscopy is the last test a practitioner will order, even though it’s the ‘gold standard’ for colon cancer diagnoses. Delays are your enemy. Colorectal cancer can be prevented and can even be cured—when it is detected early. If you’re at risk, early detection means early treatment and prevention, which means a colonoscopy could save your life. The expert gastroenterologists at the Digestive Health Center in Reno exceed industry benchmarks for quality and safety, and the medical team is specially trained in endoscopic care. The Digestive Health Center offers the highest quality care to maximize healthy outcomes. GET SCHEDULED TO GET SCREENED FOR COLON CANCER.